The 2015 summer excavations of Gradishte / Vratitsa will focus on digs at a spot located between an Early Byzantine church and a medieval Bulgarian church, lead archaeologist Nartsis Torbov from the Vratsa Regional Museum of History has announced, as cited by local daily Konkurent. This means that Torbov’s team will be looking for finds from Early Byzantium and the necropolis of the medieval Bulgarian city of Vratitsa where several graves have been found in the past few years of research. The fourth medieval grave was discovered in the summer of 2014; it was the grave of a big man with a stone placed on his chest in order to “neutralize” him so that he would not rise from the grave. The discovery has led the Bulgarian media to term the buried man the “Vratsa Vampire”. In their renewed excavations of the Gradishte / Vratitsa Fortress, the archaeologists are aided by two local workers and four prisoners from the Vratsa Prison, with two more long-term workers to join them in a few days; more diggers are to be added as the work starts to expand in scope. “This year we are starting the excavations in high spirit since we have sufficient financial support and partners. Before our digs, the tourist route leading to the fortress had been rehabilitated and extended, and it now ends just 3 meters away from the spot where we are digging,” explains Torbov. He has thanked a number of local organizations who have supported the excavations of the ancient and medieval fortress of Grafishte / Vratitsa, including the Director of the Vrachanski Balkan National Park Nikolay Nenchev, the Vratsa Regional Museum of History, the Vratsa District Aministration, and the Director of the Vratsa Prison Angel Kabaliyski. “They have made all this possible, and thanks to them we are planning to continue our excavations until the beginning of November,” the lead archaeologist points out. The ancient and medieval fortress known as Gradishte (a common Bulgarian word for a fortress) or Vratitsa (as it was called in the Middle Ages) is located near today’s northwestern Bulgarian city of Vratsa at the canyon of the Vartaeshnitsa River. It is located near the Vrattsata Pass (meaning “door”), which gave its name to the city of Vratsa, using the natural defenses of the mountainous terrain. The Gradishte or Vratitsa Fortress is an Ancient Thracian, Roman, Early Byzantine, and medieval Bulgarian city. There are hypotheses that the Thracian settlement may have been the capital of one of the major Ancient Thracian tribes, the Tribali, who inhabited today’s Northwest Bulgaria. There have been doubts among scholars whether the unearthed Antiquity fortress walls of Gradishte / Vratitsa were first build by the Romans, who often built their cities on top of previously existing Thracian settlements, or by the Thracians themselves. The fortress of Gradishte / Vratitsa was also used by Byzantium in the Late Antiquity and Early Middle Ages, i.e. the Early Byzantine period. It protected the most direct mountain pass route between what are today Northwest and Southwest Bulgaria. During the period of the medieval Bulgarian Empire, Vratitsa was a major fortified city; its name – as well as its importance – are made clear by a 13th century inscription on a stone slab which has been discovered in a cave connected to a medieval Bulgarian church. The inscription was found in 1942, and it states that the place harbored a monastery in the Middle Ages. The fortification system of the Vratitsa fortress uses the towering rocks to the north as part of its fortress wall; the fortress wall itself is about 2.4 meters wide. According to the archaeological discoveries, the settlement at the Gradishte / Vratitsa Fortress near Bulgaria’s Vratsa existed in several time periods. The first is the Thracian period from the 4th until the 1st century BC. 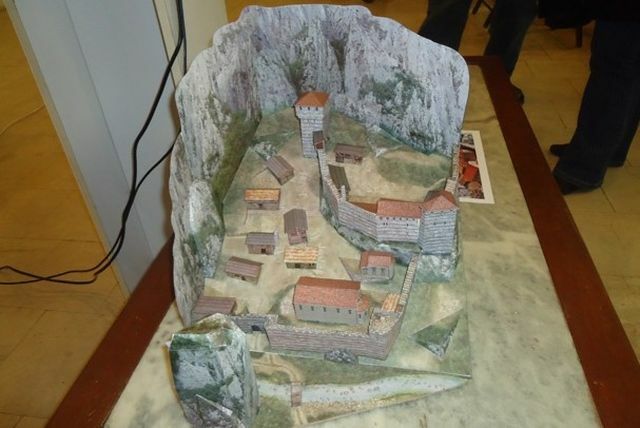 The finds hint at the existence of a Thracian fortress wall. In case of danger, the fortified area could provide asylum for up to 10-15,000 people, i.e. the entire population of the nearby valley. At the end of the 19th century Austro-Hungarian geographer Felix Kanitz described the ruins of the Gradishte / Vratitsa Fortress as having many different fortifications from different periods. Unfortunately, since then, much of the stone and rock material has been used by local villagers for the construction of homes and fences. However, the archaeological excavations conducted before 1965 indicate that the place was a settlement and fortress of the Ancient Thracian tribe Triballi during the Early Thracian period. The second period in the existence of Gradishte / Vratitsa is the 3rd century AD when it was a Roman fortress. The third period is in the 4th century AD, the Late Antiquity period which has left traces of burned down buildings. The fourth period started in the 6th century AD the Early Byzantine Empire added new fortifications to the existing Thracian and Roman ones. The fifth period is the 13th-14th century, the time of the Second Bulgarian Empire (1185-1396), which also added new fortifications as evidenced by the discovery of bronze coins and ceramics. It was in this period that the city started to expand outside of the fortress walls turning into today’s city of Vratsa over the next centuries. A total of four medieval graves have been found a necropolis from the time of the Bulgarian Empire; one of them was the grave of a big man with a stone placed on his chest in order to “neutralize” him so that he would not rise from the grave. The discovery has led the Bulgarian media to term the buried man the Vratsa “vampire”.